Group Play app has been on Galaxy S3, Galaxy Note 2, Galaxy Note 8.0 and Galaxy Note 10.1 for quite long time. If you have any of these supported devices, you can download the app in the Play Store to share music, photos, PDF documents, and PowerPoint presentations. But the Group Play in Galaxy S4 is totally different, although the identical name is used! You cannot even connect S4 with other devices using that app. This may disappoint some Galaxy S3 or Galaxy Note 2 owners. The new Group Play in S4 can share the documents,photos and presentations as what you have in S3. What was really improved is sharing music. 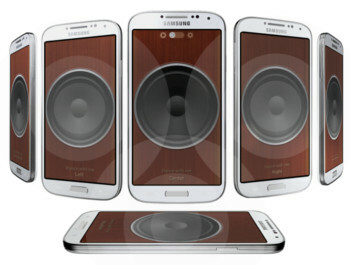 Now, in addition to streaming music to other S4 devices, it is even possible to connect all Samsung GalaxyS4 phones together to create a powerful (arguable) surrounding sound system. It is possible to share the presentation on all S4 devices. Unfortunately, no Samsung projector supports this at this time. Otherwise, this will be extremely attractive for business presentations. To start a session, simply open the app and tap create group. Then you can choose music, pictures or documents to share. To join a session, you can open the app and tap Join group. Alternatively, you can touch the back of the phone starting the session, if NFC is activated. Q1: When I try to connect my Galaxy S4 to other models through the Group Play, they can not be connected. A: Currently, support for other models is not available. Q2: I am trying to use the Group Play feature, but it does not connect. A: Please check the whether the password is correct. Please check the whether the device is connected to the other device. Please check whether the number of participating devices is more than 10. Q3: I want to change the group name in Group Play. A: Group name can not be set by the user because it uses the mobile AP. Q4: Can I use the Internet during using Group Play? A: No, you can’t use the Internet during using of the Group Play. It is not possible to connect to the Internet through the mobile network, and Mobile hotspot menu of setting is disabled. Q5: Can I share the music and photos at the same time? A: No, sharing multiple contents in real time is currently not supported. However future updates to the Software may include this ability. Q6: When I try to delete the stored photos in Group Play, I can’t delete all photos “in one go”. A: Group Play* has been implemented to allow photos to be deleted one by one. Press and hold the thumbnail image in the shared screen, and then you can delete the photo. Q7: Can I add more games in Group Play? A: Games will be added through the Play Store and Samsung Apps. Schedule is undecided. Q8 : I’ve tried to connect to the Galaxy S4 and Galaxy Note2 via the “Group Play” app, but the connection was not established. What should I do? A : Sorry for your inconvenience. “Group Play” in the Galaxy S4 works based on different connection technology from the existing platform on the Note 2. So “Group Play” in Galaxy S4 is not compatible with other existing models and can be only connected between Galaxy S4’s. Q9 : Can I share the music and photo simultaneously (i.e. at the same time) via Group Play? A : Sorry for your inconvenience. No. It is possible to share only 1 content item at a time. If you share other content, need to stop the playing music. Hi, I cant get my phone to load my music to share it in the group play app? any ideas? You can just copy mp3s to the phone. Once you connect your phone to your PC with USB, you can copy files directly from your PC to the phone. Of course, there are man other ways…. How can I get it to include all my music? how to add more songs at group play since it has 1 only. After tap share music, all music in the device will be scanned and you can select as many music as you want. You just check the music you want to play, then tap OK.
how do you add more games!?!? Most games do not support group play. Samsung failed to attract enough developer to support it. i tried to connect a german s4 with an english one, but only pictures could be shared, no music or videos…anyone have an idea why? If you bought the music from Google play store or Amazon, it is DRMed, and you cannot copy the files. For other music files, you can send the files to others (email, Bluetooth, NFC), or copy them to your pc. I have an s4, an old s3, and an s2 tab 7.0. The music won’t share with the tablet. )= The music streaming from the s3 to the s4 is noticeably lagged. Every drumbeat sounds like a flan. I say to Samsung, value reverse compatibility more highly. Group play changed a lot in each release. Now it works best with the same version only (s4 to s4, s3 to s3, s5 to s5..).